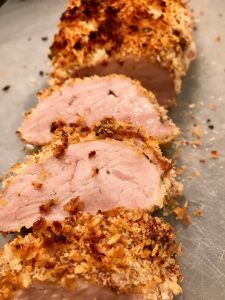 Mustard & Herb Panko Pork Tenderloin is a very affordable protein, and ideal when serving large groups. 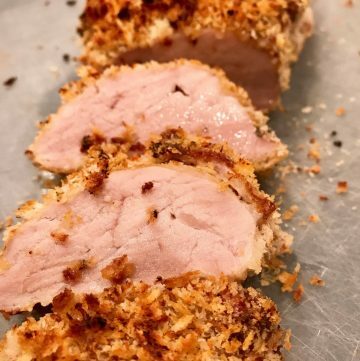 This tenderloin is seasoned with a sweet and spicy mustard, then coated with herb flavored panko crumbs and baked to a tender inside and crispy outside! The beauty of a pork tenderloin is tri-fold: low-price, lean-protein, and quick-cooking qualities. A pork tenderloin costs about 7$ per pound, versus a beef tenderloin that might be $17.99 a pound. Quite a big savings on the old pocketbook! A four ounce piece of pork tenderloin has approximately 155 calories, whereas the same size of beef tenderloin has about 230 calories. If you’re on a low-carb or Keto diet, either will work for you. Cooking times vary for beef tenderloin, depending upon how rare or well done the meat is desired. Pork tenderloin is not served “rare” or “well-done”; it is done when the internal temperature measures 165ºF. While some will argue that pork is done at 145ºF, I choose to follow the cooking instructions from the USDA, particularly with pork and poultry. Generally, pork tenderloins are sold packaged with two tenderloins per package. Some grocers sell them individually, but not often. In any case, don’t be surprised if you open a package and it has two tenderloins! When preparing the tenderloin, just wipe it down with a paper towel; as with poultry, do not rinse the meat. Rinsing meat increases the risk of bacteria being dispersed throughout your kitchen. First, once you’ve patted the tenderloin with a paper towel, apply the mustard. I place the tenderloin on a piece of wax paper. You can use a pastry brush or a chef’s best tools–your hands! 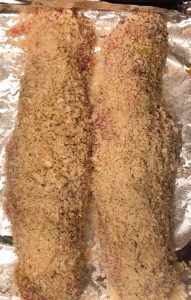 Spread out the panko crumbs on another piece of wax paper; add the seasonings to the panko crumbs, then roll the tenderloin in the crumbs. Then, place the tenderloin on a lightly oiled baking pan and cover with foil. Bake at 350ºF for about 25 minutes or until the middle of the tenderloin registers 155-160ºF on a thermometer; remove foil and continue to bake until top becomes crispy brown. Let the meat sit, covered in foil, for about five minutes. The last five resting minutes allow the juices to realign and the resting meat will come up about 5º. Use a serrated knife to slice the tenderloin; a serrated knife cuts through the crust better than a chef’s knife. Finally, if you’re cooking two tenderloins, the cooking time might be a bit longer, just keep your eye on that thermometer. This dish is amazingly delicious and so easy to make!